Morning light reflects off a pristine blanket of freshly fallen snow and a fine mist of diamond dust hangs in the air. The temperature is frigid, the kind of cold that makes your hands scream for warmth. As you traverse down the ridge, you spy your line, a blank canvas ready to receive your signature. Dropping in, you feel a sudden rush as a wave of snow engulfs your entire body. Temporarily blinded by the billowing cloud, you take a deep breath of cold smoke and emerge into the daylight for a split second. Trenching the next turn, you are back in the white room as you descend through the forest in a perfect moment of weightlessness. At the bottom of your run, you high-five your buddies and glance back across the slope at the perfectly carved “S” down the fall line. This visceral experience is hard to capture in words, but those who have visited Utah know exactly the euphoria of which I speak—a feeling so special, we spend a good portion of our time and income chasing the next fix. The “Greatest Snow on Earth” draws us to the mountains again and again, and we will sacrifice sleep, steady jobs and even relationships to find ourselves there. Powder is a precious resource, and we snow-sliders need to do all we can to protect it. Not only for ourselves, but for all those youngsters who represent the next generation of rippers. Our tribe is in a unique position to address climate change, and working together to find creative solutions to problems is essential if we want to continue enjoying the snowy environs. 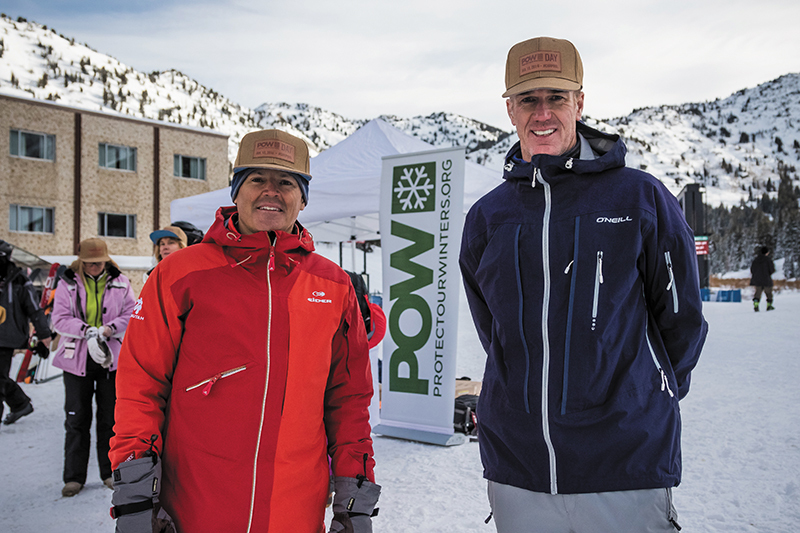 In 2016, POW and Ski Utah created POW Day, an event aimed at engaging the local snow community by promoting carpooling and utilizing public transportation to get to the mountain. “The transportation sector is the second largest contributor to carbon emissions, so while reducing the amount of cars heading to the resorts doesn’t solve the problem, it does get people thinking differently,” says Steinkamp. For 2017, POW Day is collaborating with fours resorts as well as local businesses across the Wasatch Front to grow the event from last season. Jan. 13 is a historically snowy day in Utah and so naturally this is when the event will take place. “This year we will be collaborating with Alta, Snowbird, Powder Mountain, and Sundance, as well as Discrete and SNOCRU,” says Ski Utah Director of Communications Paul Marshall. “We are planning on using the SNOCRU tracking app to see which mountains are seeing the biggest turnout and perhaps measure the success of the event.” All those who carpool with three or more people or take UTA will receive a limited-edition POW Day beanie from Discrete, and carpoolers will have access to priority parking near the lifts. On-mountain parties and group shred sessions will also be promoted as the organizations rally the community to get behind the cause. In attendance at POW Day will be members of the POW Riders Alliance, such as Julian Carr, Caroline Gleich, Brody Leven, Pep Fujas and others. This group of influential athletes lives POW’s mission and takes an active role in the advocacy of clean energy and environmental protection measures. “Being a skier goes hand in hand with promoting environmental responsibility,” says Gleich. 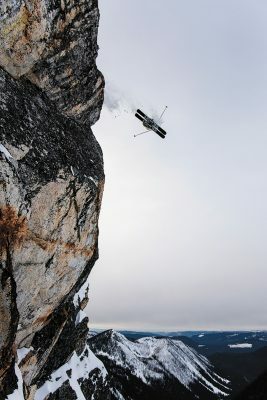 “As skiers, we are closely connected to our natural environment. 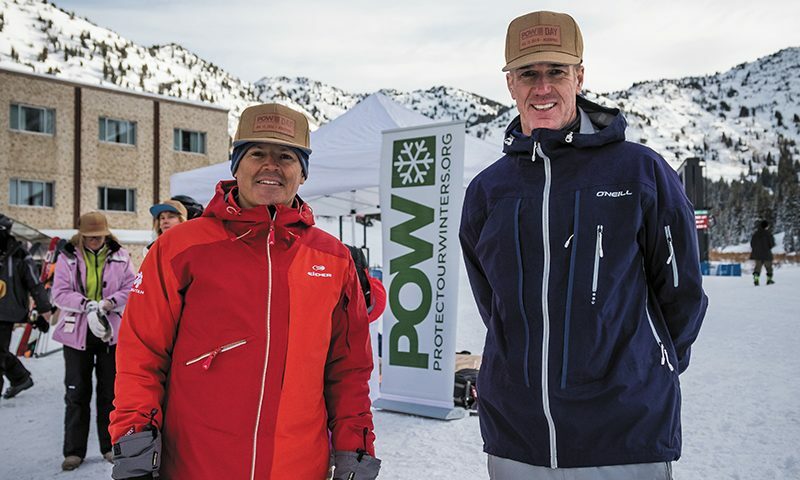 We have a duty to protect the places we play.” The involvement of these athletes and that of all the skiers and snowboarders in Utah is necessary to continue building on the momentum that Ski Utah and POW have created. Striking up meaningful conversations with those of similar mindsets is one side effect of the event, and it is amazing what an organized group of people can accomplish over time. In a world of dynamic social challenges and tumultuous political campaigns, we often head for the hills to clear our minds and rejuvenate our spirits. Being surrounded by the splendor of winter is something that anyone can appreciate. Let’s all get excited about ensuring that this is an experience we can enjoy for years to come. For more info on POW Day, or to get involved on a local level, check out protectourwinters.org and skiutah.com/media-room/pow-day.